This work was created shortly after and informed by the second presidential election of George Bush in a period in which the media were consumed by how the division of the country in red (conservative party dominated) and blue (democratic party dominated) states would end. (The red states becoming the legal winner of course, resulting in a state of shock and alarm for many in my part of the country.) A period also of heated discussions and cultural battles between the proponents of the different parties and candidates, each proposing their views. A color that comes to mind was red. In my view the core of art is dialogue, and not just the masterful packaging of ones predetermined vision. With dialogue I don't mean only the format of an exchange between different entities but also a particular quality in how that exchange is engaged, in which one each participant is prepared to honestly listen to different aspects and realities inside and outside oneself and in the process sets out to create the most satisfying new synthesis. To me real dialogue is a courageous and passionate engaging with the moving here and now. It involves an active engagement with ones environment, and with how we perceive reality. Politics, the way we make decisions and rules about our shared world, can be a great realm of dialogue. Unfortunately the political process too often seems to be hampered by an unbalanced self-interest, people preaching to the choir, people feeling powerless, or having decided for just plain disinterest. The preaching for the choir is something I like to avoid in my work, instead I seek to encourage an attitude of dialogue, and an empowerment of an inclusive audience in creating the world. As a 'legal alien', in other words a legal resident without the right to vote, I was still interested in the process and outcome. By the way, I believe anyone invested in residing at a certain place, thereby is a contributor and factor in one way or another to the making of that place, and should have a say about how he or she is represented in that area's government. I had been eyeing a particular site on the Mills College campus for a while. It had some components that were bound to attract me: windows, light, a thoroughplace with many people (a possible fairly inclusive local audience) coming through, an in-between between in and outside, and between art world and public space. It had an interesting spatial feel and function too; from the outside it seemed like a wall of windows, with a door in the middle. Once you entered you found yourself in a corridor where you could choose between going left or right, or linger and read announcements on the corridor-wide bulletinboard. This was the entrance to the main art building on the Mills College campus. On the outside side of it was a square, sided by an entrance road on one side and art related buildings on the other. For this site I made a temporary change to a part of the windows, which I covered with matching panes of transparent red plexiglass. So creating the temporary presence of a large monochrome 'painting', integrated into the architecture of the building. More importantly so it created a temporary space, or you could say it visibly marked and defined the pre-existing space which was a maybe until then somewhat taken for granted, nice, and foremost functional space of entry. The changed site not only made possible a heightened awareness of the visible presence and play of light, but also engaged both sides of the window as part of the same situation, in which the point of view made a clear difference. I hope it invited to slowing down and taking in of what the experience of the space also could be, aside from being just an entrance, a door opposite a bulletinboard. There was a simple pleasure and decorative side to the work too. Over a period of months, by removing sections of red plexiglass, I created a total of three states to the work, before it disappeared. The first one was Called Red States, the second one Target, and the third one Lens. Lens, the last manifestation of this piece, coincided with the 2005 Mills College MFA show, as a third and second outside part of my graduation presentation. How have you been an artist today? Mills College Art Building entrance. 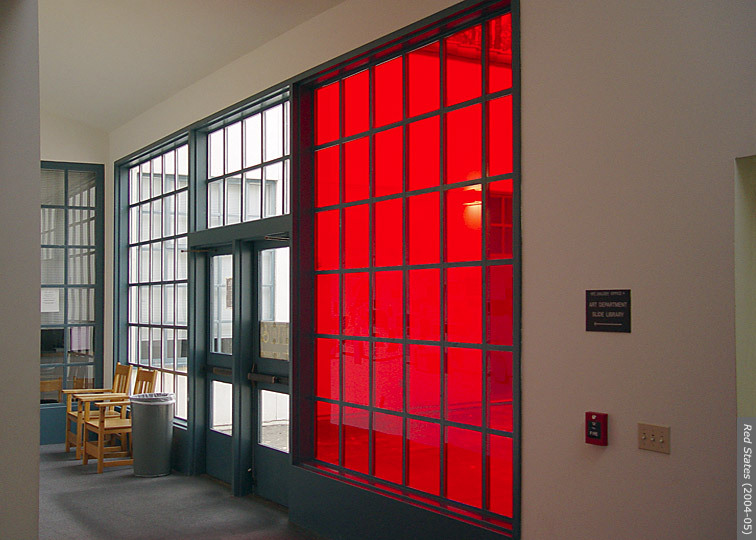 Window installation, with matching panes of red plexiglass covering a section of a wall with windows that included the entrance door to the main art department building. By taking away panes three different states were created over time, until its disappearance.